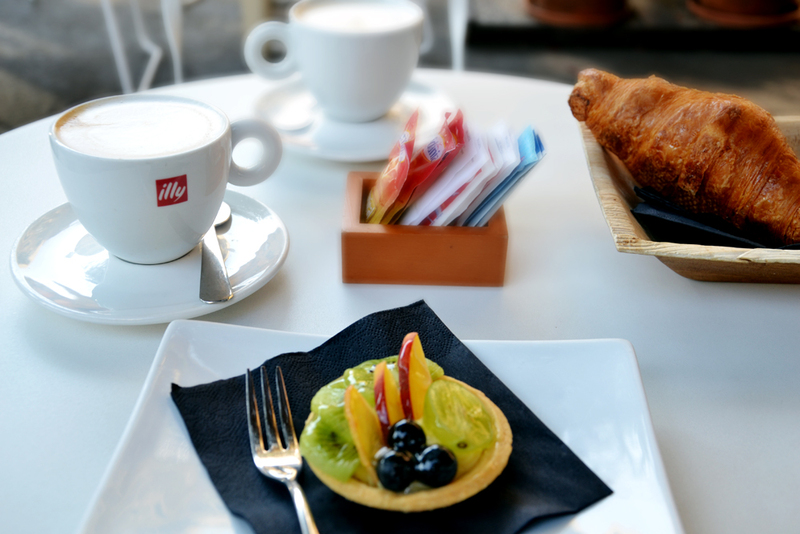 Having woken up late this morning, we decided to have a light breakfast in one of my favorite places in Rome – Settembrini. 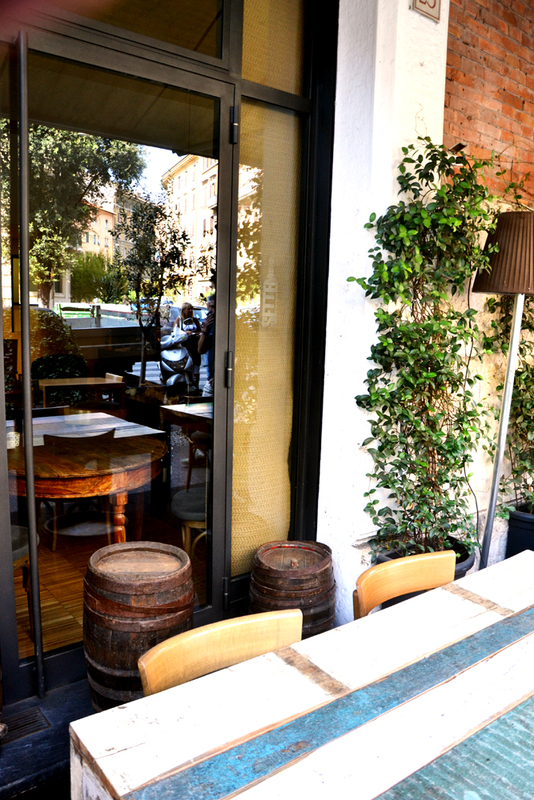 Over the last year, this has become of one hottest spots in Rome for its great food, service and atmosphere. 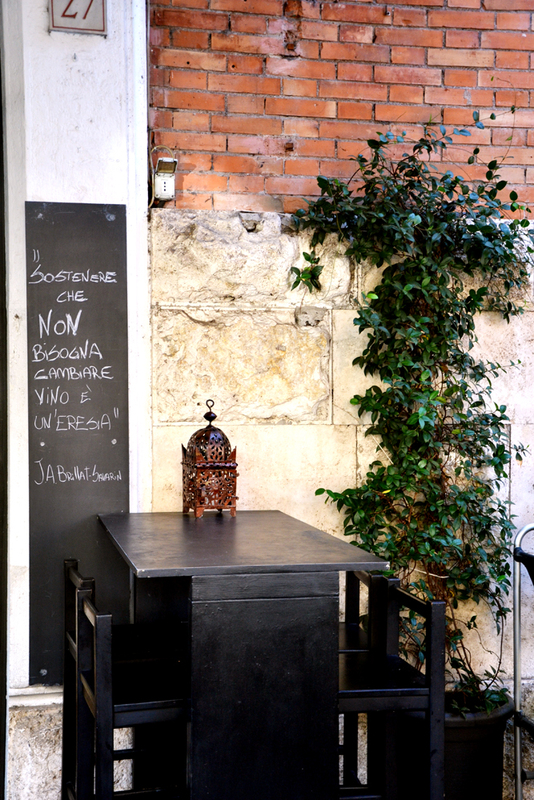 It is important to highlight that Settembrini is open for breakfast, lunch, happy hour, dinner and after dinner!!! Besides an excellent and vast wine list, Settembrini prepares great cocktails served with scrumptious finger food: small panini with mozzarella, tomatoes and pata negra ham; fish tartare with mayonnaise and seaweed; duck breast with spinach and orange; Japanese style tuna spaghetti; bread, butter and anchovies. I love love love this table!!! Below our breakfast this morning: two delicious cappuccinos, one croissant and a fruit tart. Below it says: “To say that we should not change our drinks is a heresy”, Jean Anthelme Brillat- Savarin. Do you get the picture how this place is serious about drinking? Stellar photography! I agree, the table! The cappucino is picture i so-o-o-o good. Well done. What a fun restaurant! Looks like a great time. And, congrats on the award. It’s well deserved. Thanks for passing it onto me! Thank you!!! I love your site so it is well deserved!! 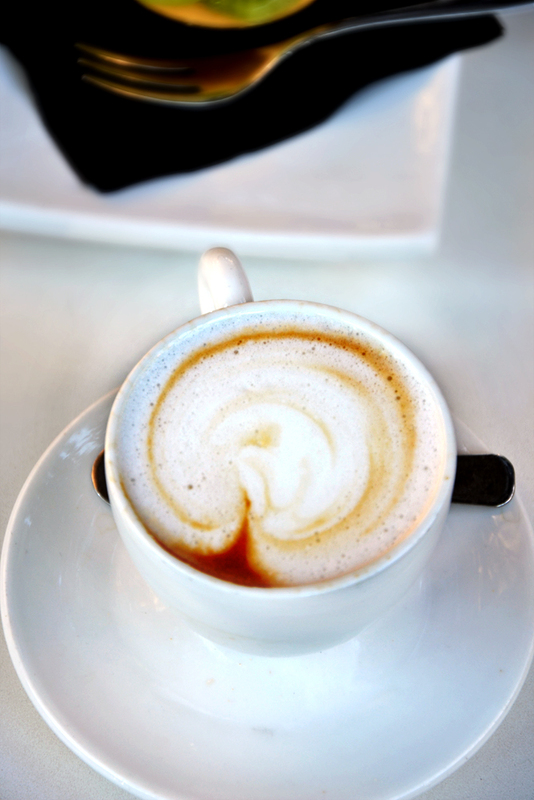 Love the photos – especially the cappuccino – time well spent with Roger! Sounds like a great place. 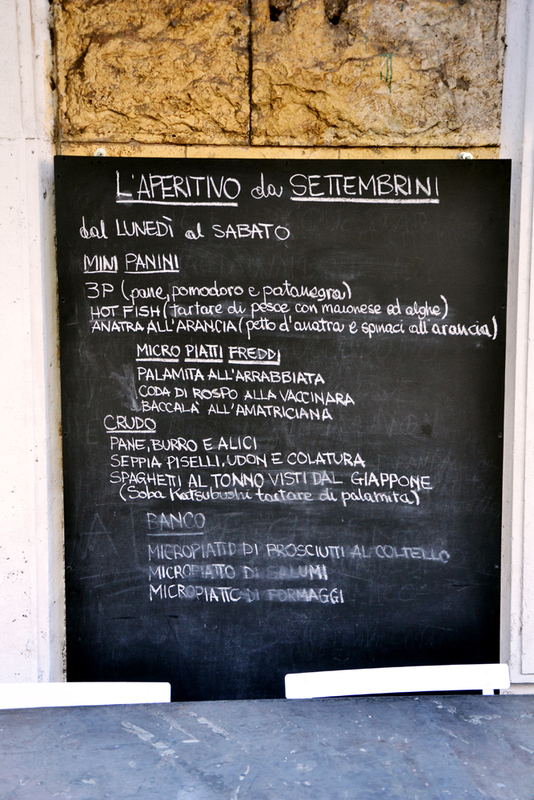 When we do eventually make it to Rome will have to take a list of your restaurant recommendations. Your photos are very well-taken and definitely inspiring! Thank you very much for passing on the award. I’m yet again glad to receiver it! Oh you are welcome!! I love your recipes!!! And yes!! Waking up late is good sometimes!!! De nada!!! Me encanta tu sitio y tus recetas!! That table is too cool! Thanks for listing me on here. You picked some wonderful bloggers and it’s so nice to be on the list. You are welcome Greg!!! Oh that table is awesome, isn’t it? What beautiful photography! Your posts remind me of the wonderful times I’ve had in Italy and wish I were planning more. Congratulations on your well-deserved awards. I’ve enjoyed getting to know you a little bit more. And, oh, yes, FORZA ROMA!!!! Thank you John!!! FORZA ROMA!!! FORZA ITALY!!! Thank you for your kind words!!! As far as vacationing in Italy during summer, I think Sardinia Island is great because it has kids-friendly resorts with stunning beaches. Another beautiful Region is Puglia (Apulia). Please feel free to contact me at talesofambrosia@gmail.com should you need further information!!! “I love love love this table!!! Thank you! And thanks for stopping by!!! I am also glad to meet you!! Just catching up after being away, so I’ve come a bit late to this breakfast. It looks a wonderful place to eat! And thank you for including me in your list of blogs that you’re passing the award to. I’m very flattered, coming from you, but I hope you won’t mind if I don’t pass it on further as I decided when I began blogging that I wouldn’t participate in these. Thank you very much for the compliment, though! You are very welcome!! And don’t worry, I understand if you do not want to participate on this!!! However, I included your blog since I think is wonderful! I also love that table and I love your breakfast, This place definitely seems like a place I would visit. Your photos are simply wonderful. I also want to say Thank you so much for giving me this award. It really means a lot to me. And I just about love each and every blog you’ve nominated :). Thank you! Your blog is awesome and different this is way I think you deserved to be awarded!!! I am mentally running to Rome right now’ everything looks amazing! I can think of no other place where I would love to be! Your photos are captivating and make me long to be right there with you! Congrats on your awards, and thank you so much for my mention…I take your opinion highly and am so flattered!! Aw!! You are so so kind!!! Let me take your words for I cannot think of a nicer person than you!! !